A group of students at a local high school use Catalysts to build seats. They are placed near tables in a park on the school grounds. 20 years later a student goes out to the park for lunch. She sees some interesting looking seats. They look comfortable enough, so she decides to try one out. As she sits down, a chime on her phone notifies her that there is a smart object nearby. The student checks the notification and it leads to a website with pictures from another group of students twenty years ago. There are pictures and video of this group of students collaborating to build the park, stories about one student learning how to use a hand saw for the first time. There is video from the celebration on opening day when the park was finished. There are comments about realizations that other students have had while sitting on the seat. One story from a few years ago about a student’s first kiss, another story of mourning a loved one’s death. Yet another story is from a student who was struck with inspiration to create art. The student that went out for a sandwich realizes that this seat has a legacy. It was built by people just like her. She realizes that this is a place to think, and to create and to live. Kida cheesy I guess, but its a lot more fun than talking through the technological opportunities that arise with NFC and a smart phone. If this is something you’re interested in, the NFC tags are super cheap, only about $1 each, and it super easy to program them, easier even than making a gmail account or signing up for facebook. You can put in any URL for the website, so it is easy to share stories on facebook, tumblr, or any web platform. 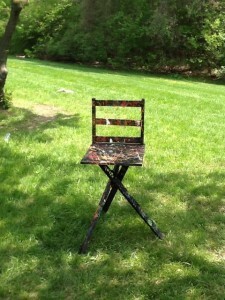 This idea was inspired by my grandmother, who built a WikiSeat, then donated it to the thrift store. There was such a wonderful story that went along with her making the seat, but there wasn’t any connection between the seat the story. I feel like so many objects in our lives have stories that go along with them, stories that need to be told. This is one way of using a bit of magical technology to forever link the original creation story to the object, then allow people to add their own stories as time goes on. Addendum 1-4-14: I think it is important to use new technologies to make beauty, otherwise commercial industries will just use it to commodify things, then technology becomes boring. Technology is only as interesting as the applications, and while NFC/RFID has incredible potential, it is almost entirely boring at the moment.